The day continues about like this till the Fool realizes life can’t be this bad—really, it can’t—and leaves work early to go to the Harwood Museum in Taos. Convinced ahead of time that an exhibit called “Work by Women” is going to be pastel, the fool is delighted to find herself proved nearly right by the works in the first gallery: ah yes, Mary Blumenschein’s blurry study of unrecognizable flowers in a vase—but then the Fool remembers, reluctantly, the Blumenschein house up the street where Mary’s husband, a much better-known painter, clearly had pride of place… And the same might go for Mary Ufer, also overshadowed by a much more well-known painter husband. 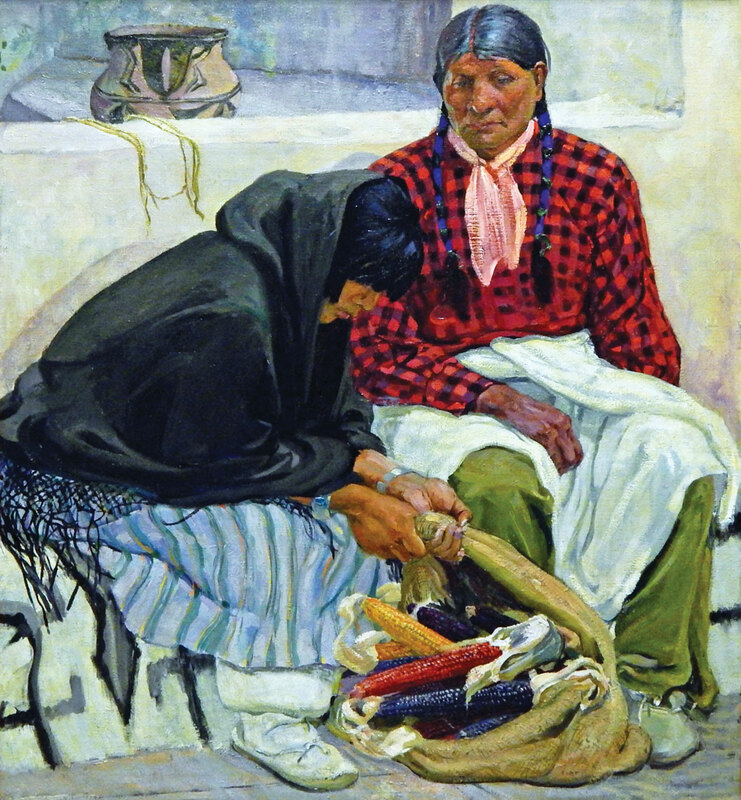 Her “Taos Pueblo Woman” is a portrait in stoic discomfort, the only indication of rebellion the clenched right hand of the traditionally-dressed woman, painted in blocks of bright color that seem to lead toward abstraction. This big gallery is called Vanguard—and the artists in it seem to be in the vanguard in one way, at least, creating lives in what was in the 1930’s a poor, dusty, isolated mountain town in the southern Rockies. 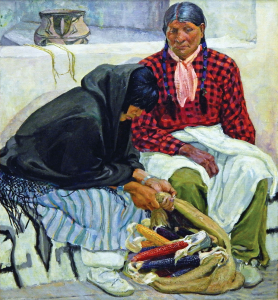 Taos, as well as Santa Fe, was settled by men who became well known as painters; the women they married never made the same deep marks. But then comes Blanche Grant’s small oil of a sideways glancing Taos man, titled “Eyes Averted.” In addition to her accomplished technic, Grant is the first to evoke the silent resistance of the Indians white people had come west to subdue, colonize, support and supplant. 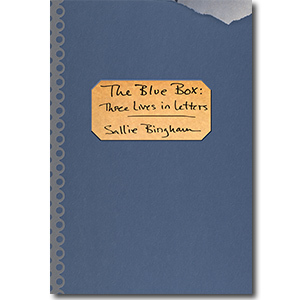 She spent most of her life in Taos, writing about the town’s history and supporting herself with magazine illustrating; the materials for her major work, never published, on Taos history repose at Harvard’s Houghton Library, or rather in its off-site storage. 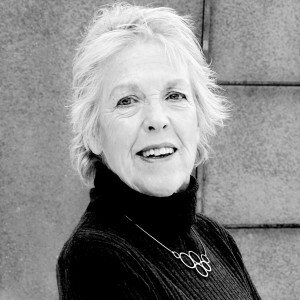 Her whole story is symbolized for me in the number of institutions, here and abroad, she “studied at” in the years at the end of the 19th century when it must have been difficult for a talented woman to feel at home in the only places that would lend her the authority she needed to pursue a career. 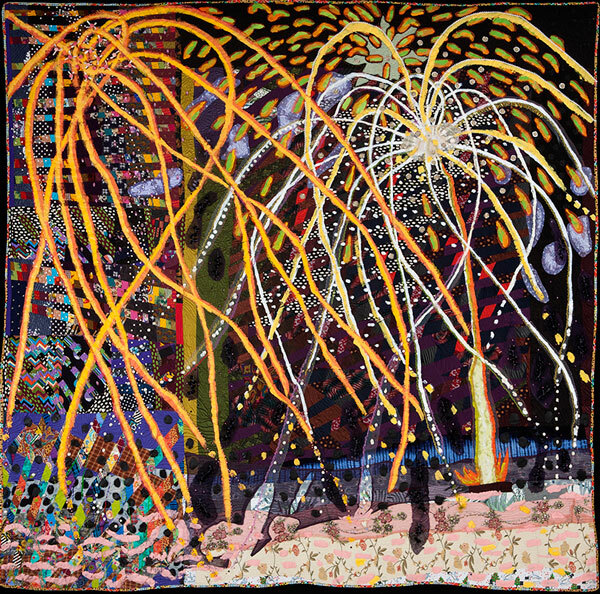 But then comes the enormous light-filled gallery where the work of contemporaneous women artists is hung, astonishing in their sheer size—not so long ago women only created small works—and the use of traditional materials—beading, quilting—in surging original designs. 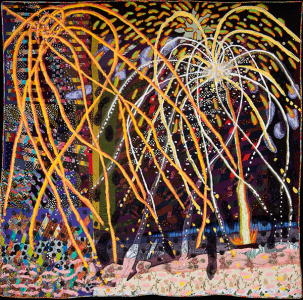 My favorite is the splendid “Taos Mountain Fireworks,” a transformed quilt that made me wonder why I have ever hung anything else on my walls. Terrie Hancock Mangat asked when she was six for some pieces of fabric and went on from there, using what used to seem limited in possibilities to open up the sky. 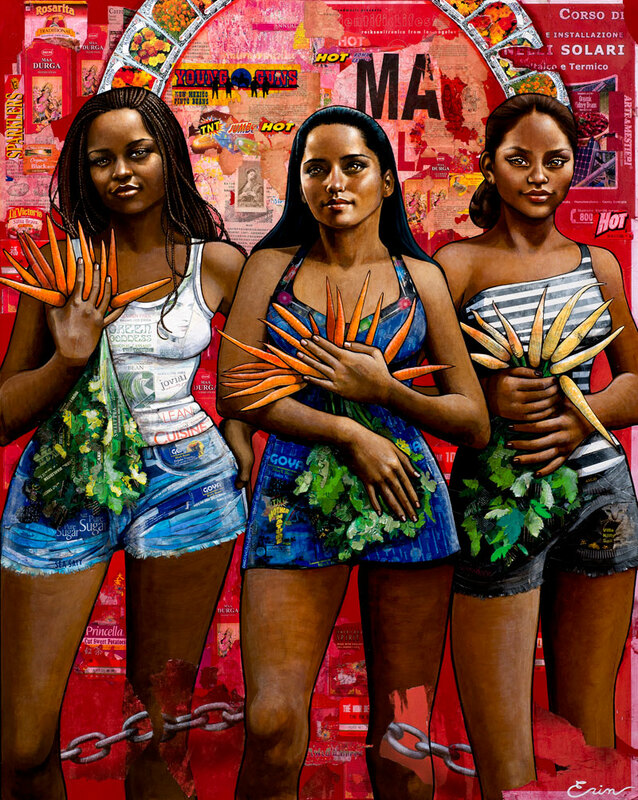 And, on the top floor, the Fool was dazzled and overwhelmed by the towering works of two great contemporary woman artists: Jolene Nenibah Yazzie’s black, white and red, “Sisters of War”—Valkyrie-like warriors launching against a common foe—and Erin Currier’s huge display of women of the Frontera. I wasn’t going to see this exhibition. But now I will. Thanks.